In 1904, Louis Cartier granted the wish of the famous Brazilian aviator Alberto Santos Dumont: to be able to tell time while flying. Cartier Santos watch has had a long history of one hundred and fourteen years since the first wristwatch was born. Many new models of Cartier Santos collection have emerged in endlessly and met people’s demands. It’s worth mentioning that Santos De Cartier watch with smartlink system made a surprise appearance at 2018’s Baselworld Watch Fair. An introduction on How many kinds of watch bracelets Cartier Santos Collection will be presented to you. Cartier Santos watch bracelets are available in different materials and colors. We can exchange leather straps for steel bracelets in the summer. I will introduce the watch bracelets by series. 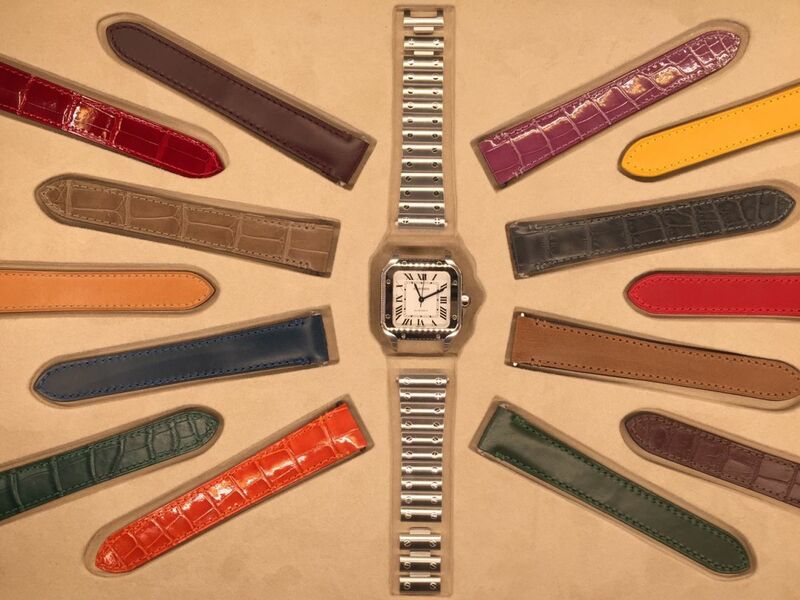 All models of Santos-Dumont Watches are equipped with alligator-skin straps, adjustable folding buckle, whose materials stay consistant with the cases’. With black, black semi-matte, brown, brown semi-matte or gray semi-matte straps, Santos-Dumont watches stand out vintage style and deep friendships. A wristwatch represents taste and status, and it’s important to select and use right strap to match with the watch case. Alligator-skin leather is the most common and toppest one of many leather materials. In general, it can be used for two to three years. All models of Santos 100 watches are equipped with alligator-skin strap except for Santos 100 Carbon watch that matches with black calfskin strap. The alligator-skin strap with triple adjustable folding clasp has been one of iconic features in Cartier. The black calfskin strap and Santos 100 Carbon watch is a good match. The new generation of Cartier Santos watch, Santos De Cartier watch made a surprise appearance for classic looking and special designs for detail parts at 2018 SIHH. What’s worth mentioning that new Quickswitch & Smartlinks systems. The new Cartier Santos watch has steel bracelet and calfskin strap to exchange. The two bracelets are equipped with the “QuickSwitch” interchangeability system. It’s easy for wearers to exchange either of them with the QuickSwitch system. Thanks for SmartLinks system, wearers can remove redundant links by themselves without any tools. All in all, there are five bracelets, alligator-skin strap with adjustable folding buckle, alligator-skin strap with triple adjustable folding clasp, calfskin strap with steel triple adjustable folding clasp, steel bracelet with “SmartLink” resizing system and calfskin strap with steel double adjustable folding buckle.